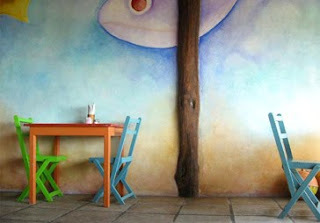 The east coast weather has got me thinking Vacation and at the top of my list is Hotel Zamas in Tulum, Mexico. Hotel Zamas: “a small beach cabana hotel with thatch roofs and colorful tile décor – is pure jungle luxury with a splash of sea. Situated on a strip of the Mayan Riviera, the rustic-chic ambience exudes hammock culture…” I’ve got jungle fever just thinking about it. With the Mayan Ruins close by, this trip makes for a perfect mix of relaxation, exploration, and beach lounging! Seriously, take me away! I’ve been dropping hints for a little while now so I’ll keep you posted if anything transpires! In the meantime, bundle up east-coasters, because there’s no sand in sight around here. 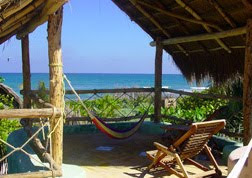 Betsy and I spent about a week in a thatch hut on the beach in Tulum a couple years back, it was really nice. If I go back I want to try the kite boards that you can rent.